We've already got reviews of Sheriff Pit-Stains and Carl Poppa, so we might as well complete the family. 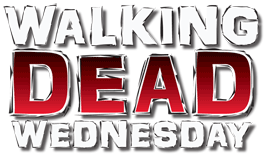 You've gotta give The Walking Dead credit - Lori Grimes may have been a bit selfish and regressive personally (her idea of "trying to create a life worth living" involved the women cooking and cleaning while the men were in charge of all the protection), but the show never shamed her for sleeping with Shane. They both legitimately thought Rick was dead, and their relationship grew over time. She wasn't treated like some gigantic ho-bag for daring to do anything other than chastely wait for her apparently-deceased husband, which is surprisingly mature for pop culture in general, let alone a horror property. Of course, it may help that she had plenty of other personality flaws they could exploit for drama. But since she's part of the "In Memorium" series, it's safe to say none of that matters now. 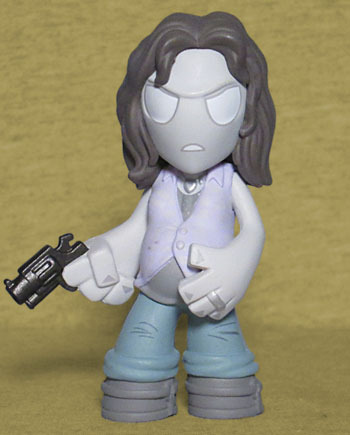 Just like in the comics, TV Lori became pregnant, so this Mini is swollen with belly-fruit. 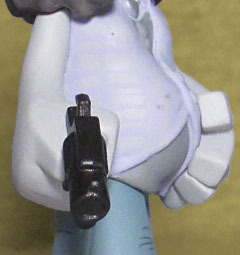 Her left hand, molded with her wedding ring, is holding her stomach, while her right hand has a revolver. Considering that at one point Lori was a total hoplophobe who didn't even want Rick teaching Carl how to shoot, that displays how she'd finally adapted to the realities of the world they were living in. She's wearing her usual outfit: boots, blue jeans, a sleeveless top and a flannel with the arms cut off to be converted into a vest. Yep, this is definitely what she was wearing when she died, even if the colors have been super-desaturated in the style of this series. "In Memorium" Lori is available in a 1:24 ratio, found on the top layer in the middle-right position, same as Gareth.